As a lover of fashion, I noticed the details of the beautifully designed clothes in the paintings, so I choose the topic Fashion and Impressionism for my research paper. Dr. Barton felt it was an abstract idea…something she hadn’t heard of before. She approved to go forward with the idea after I gave her a few connections that I had observed. I was so surprised when Vogue Italia announced the opening of an exhibit September 2012 at the Musee d’Orsay titled ” Impressionism and Fashion” ..–are we all connected by E.S.P. in the universe? Brigid Barton’s colleagues, Gloria Groom from the Art Institute of Chicago and Guy Cogeval, the curator of the Musee d’Orsay, launched an incredible exhibit exploring all the details of the development of Parisian fashion depicted in the paintings and the related articles about stores and journals. I’ve posted a condensed version of my paper and the reviews from Vogue. I hope you enjoy reading it! Please give proper credits and link back to deleusejewelers.com if you use my writing/images. Fashion Is Dictated By Societal Changes, Fashion and Impressionism after Haussmann’s redevelopment of Paris. 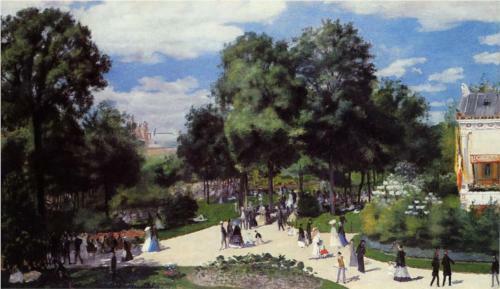 Manet’s, Music in the Tuileries also depicts a leisurely Sunday afternoon in Haussmann’s modern Paris. One can easily identify this gathering as upper class by the refinement of their extraordinary dress. Their overall posture and dress clearly demarcates the differences between the upper class women and the workingwomen that were painted by Renoir from Montmartre. 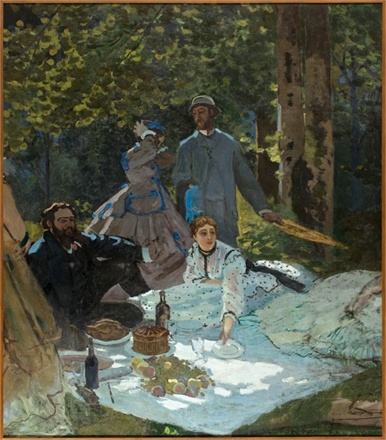 With the addition of cafes as a place for social gathering, Manet’s, Café Concert captures this essence of social intermingling. 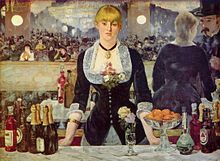 A crowded cafe with a woman singing, a beer drinking waitress (with her hand on hip exerting her independent attitude) and a man and a woman of different classes, obviously not a couple, sitting together at a table is a snapshot of an entire cafe scene. Each character’s class status is easily identifiable by their mannerisms and dress. The painting relays the energy and easiness of intermingling of different social levels in public places. Haussmann’s new Paris incorporated a newly constructed opulent Opera House and Mary Cassatt painted women at the opera. In Cassatt’s, Woman in Black at the Opera and Two Young Women in a Loge we get a glimpse of the formal dress for the young and old attending the Opera House. 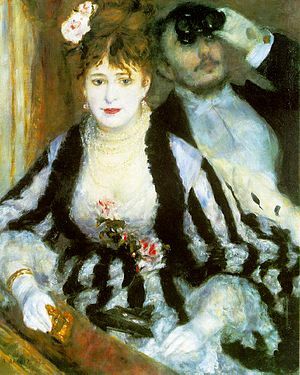 The most elegantly dressed woman attending the Opera, painted by Renoir in The Loge is a perfect example of a woman of wealth and upper class. Her jewelry is abundant with layers of pearls, pearl earrings, a gold wristband and her gown is decorated with handmade lace, complemented with flowers. In the midst of this opulence and sophisticated entertainment her face reflects sadness while seated next to her handsome husband. It has been conjectured that when a women wore a band of black ribbon around her neck she is giving a signal that she is available for sexual pleasures as her means of income. 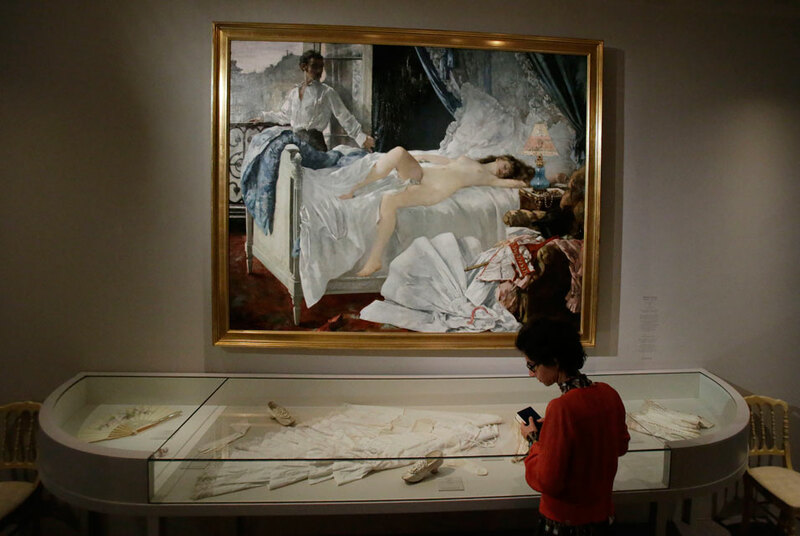 This idea may stem from Monet’s, Olympia, a women looking directly at her viewer with desire, wearing nothing but tiny slippers, a gold banded bracelet and a bold black ribbon with a pearl around her neck. 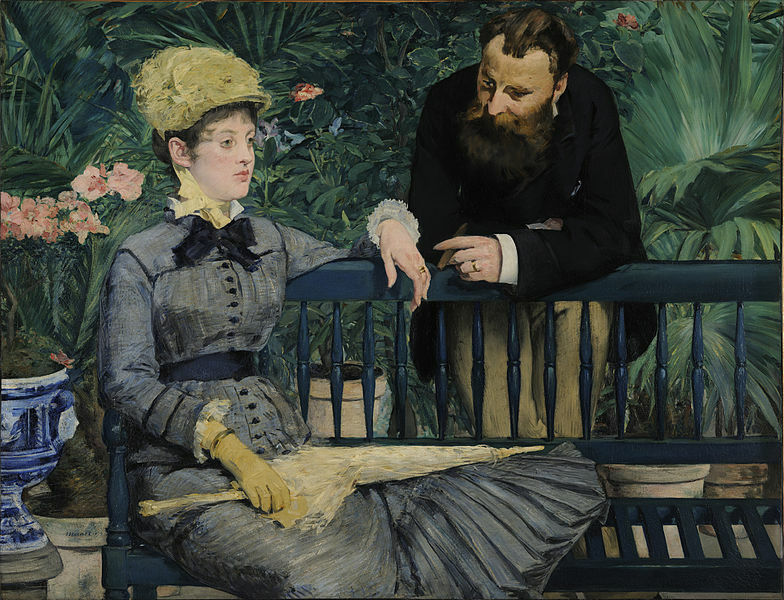 However, after viewing several Impressionists’ paintings of women from all ages and classes sporting black ribbons around their necks, I concluded that the black ribbon necklaces was the current style. Women who are obviously not prostitutes were painted with similar black choker ribbons. 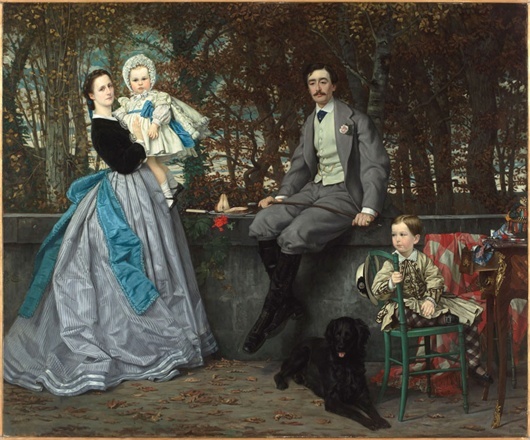 For example, in Manet’s, The Railway, the child’s nanny is wearing a black band around her neck. 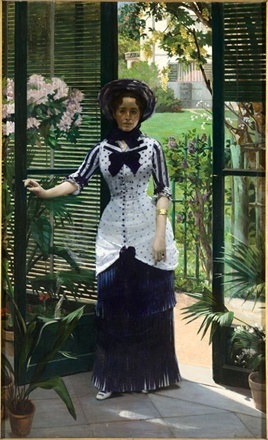 The wealthy woman painted in Morisot’s, Summer is very fashionably dressed in white summer lace ruffles and wearing a black ribbon. With her hat and parasol in hand, she clearly represents femme Parisian— chic, wealthy and ready to promenade on the newly created boulevards and parks. The young ballerinas famously painted by Degas, are all wearing little black ribbons tied around their necks while in practice in Monsieur Perrot’s Dance Class, as do their mothers waiting for them in the background. Women of wealth, women of meager means and of all ages wore black neck ribbons, a fashion statement captured by the Impressionists.